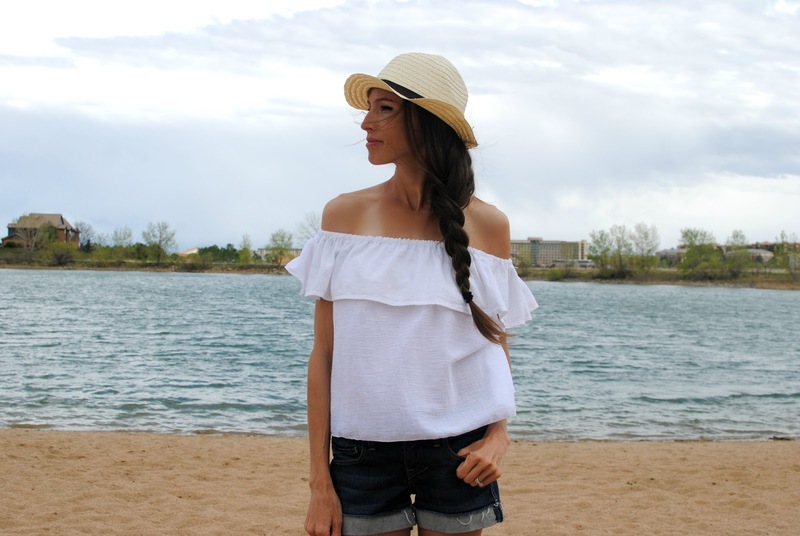 Create this off-the-shoulder ruffle top I designed for summer! This is a versatile top that can be casual or dressed up for a special occasion. I chose a light weight organic cotton gauze to keep it breezy for the Georgia heat. You can make the hem longer for a dress or add trim for extra details. Once you get the hang of this pattern you’ll want one in every color and print. 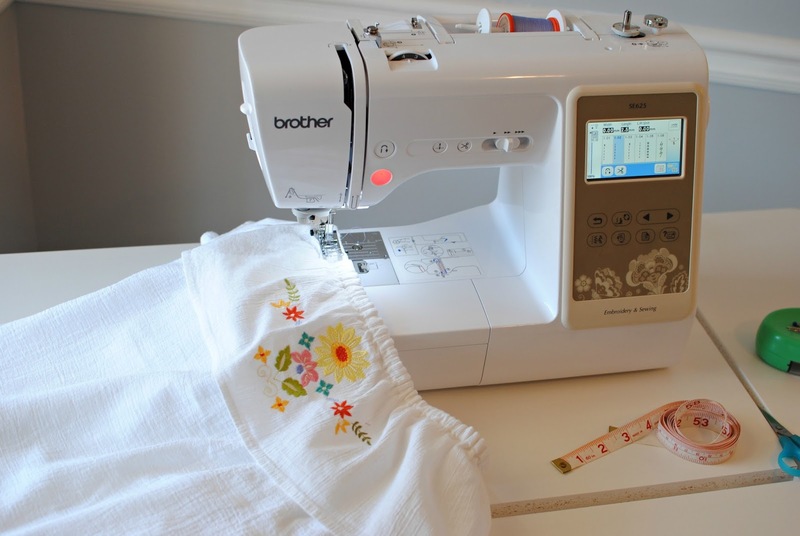 Get the details below on how to make your own. 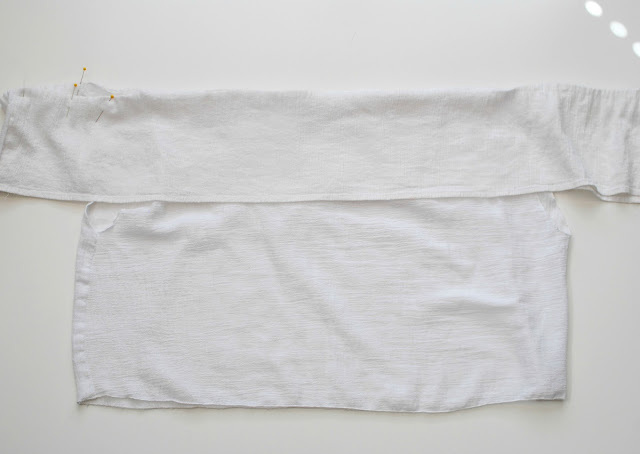 1.5 yards of lightweight, semi-sheer fabric, I chose an Organic Cotton Plus white cotton gauze here. Go with fun prints here or keep it basic. Create a pattern for cutting your pattern pieces with the template below. Use the template above to create your pattern. 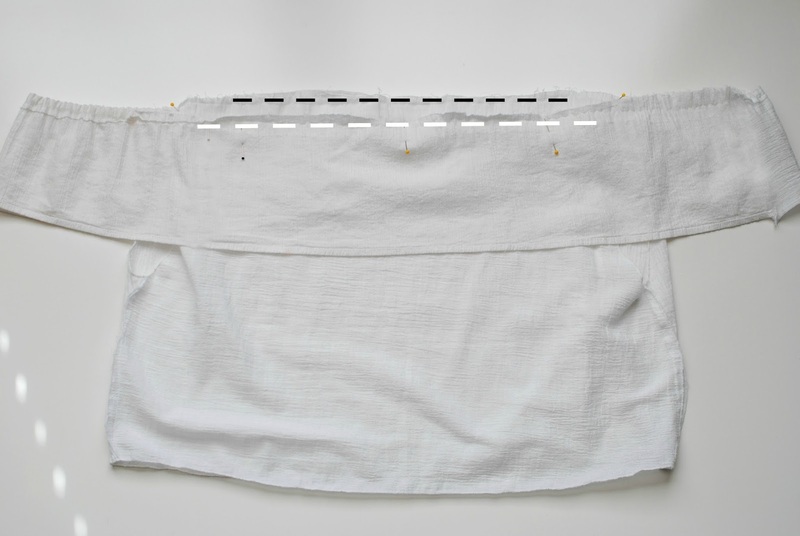 Begin with 2 rectangles of fabric as if you were creating a flowing tube top. 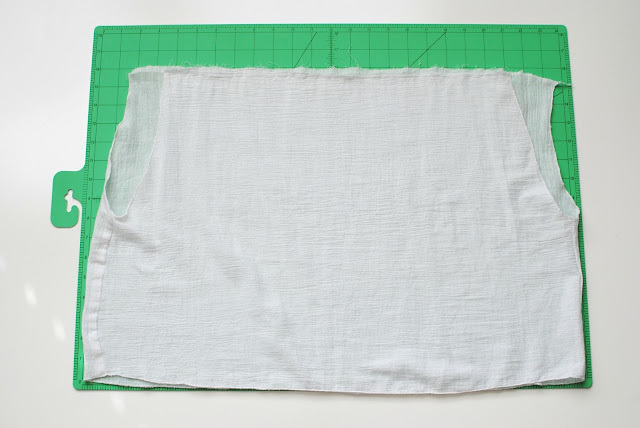 Cut a slight slant on each side to create armholes. 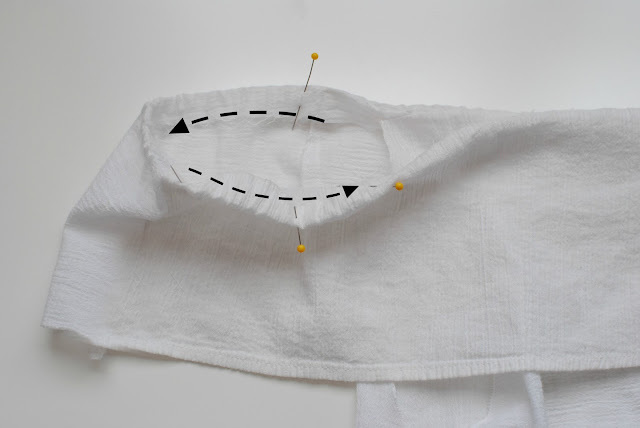 For accuracy measure your underarm to where you’d like your top to be and add 1" for hem allowance. Sew the front and back pieces right sides together. 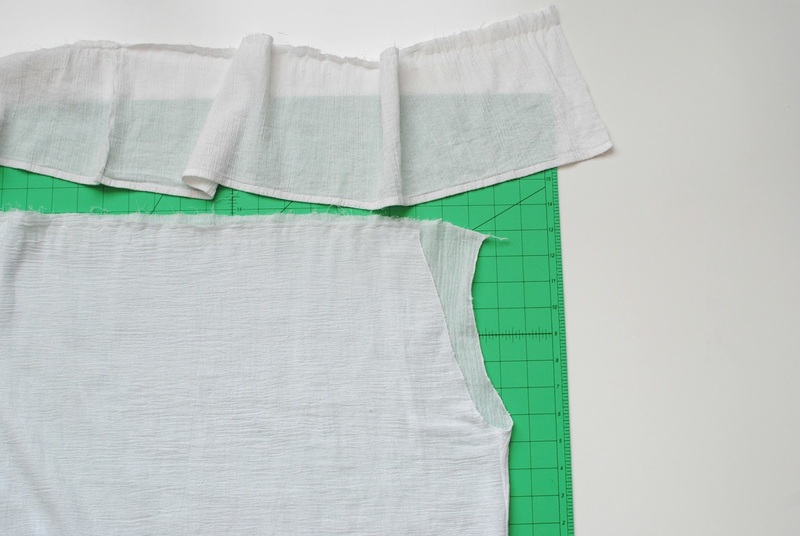 Cut a strip of fabric for the ruffle that is double your shoulder circumference for the width and 8 inches for the length. 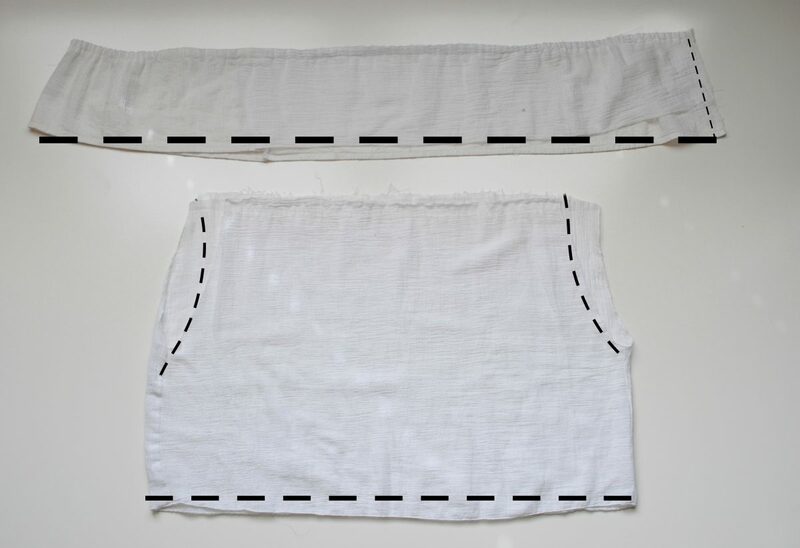 You will want to add a hem allowance (1/4 in. – 1/2 in.) to the length. 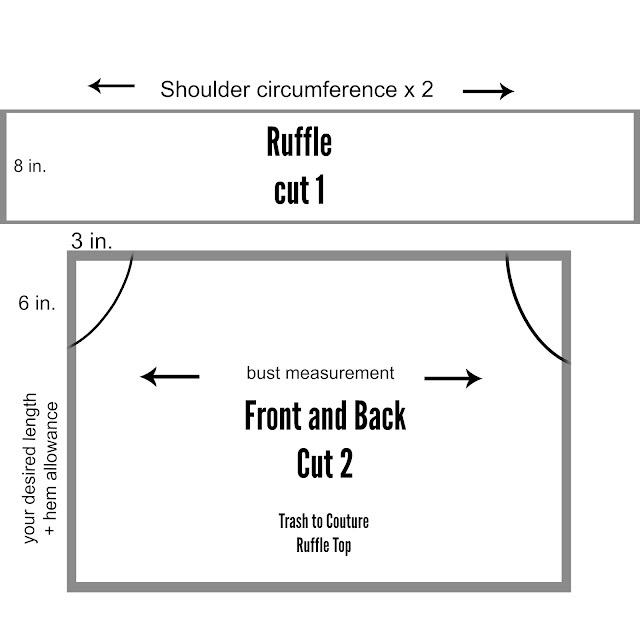 You can divide this measurement x 2 and create a front and back pattern piece for the ruffle as well (+ seam allowance). In case you don't have a full width in fabric. Finish the edges of your ruffle, bottom hem, and arm holes. Sew the ruffle into a loop right sides together. Pin the center seam of the right side of the ruffle to the center of the wrong side of the back bodice. Pin the alternate center of the ruffle to the center of the front, again right side of ruffle, wrong side of bodice. 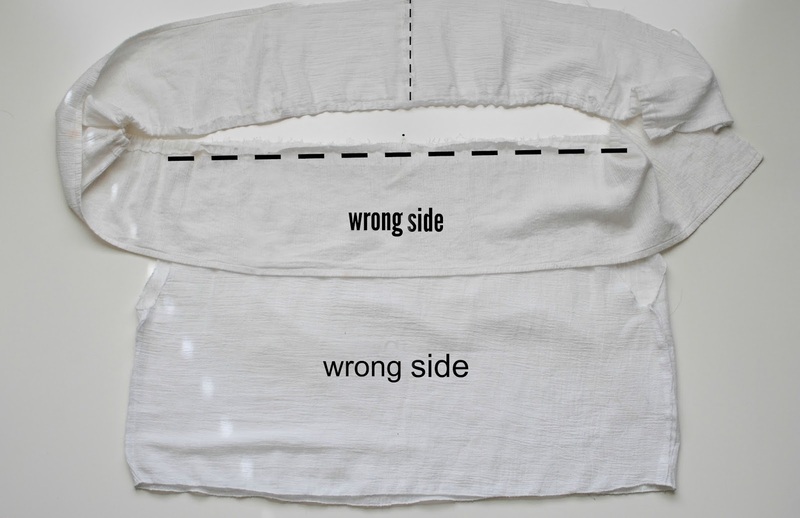 Sew right side of ruffle to wrong side of front and back portions only with a 1/2 inch seam allowance. 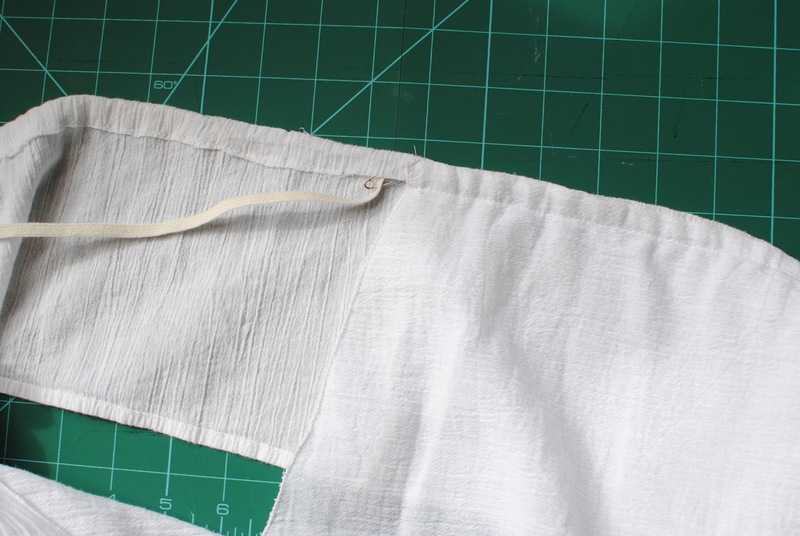 Now turn the bodice right sides out and flip the ruffle so it hangs right side out and press. For the rest of the ruffle that will cover the sleeve, press 1/2 inch over. Now we will create a casing for the elastic. Start at the sleeve portion leaving a 1 inch opening for the elastic and top stitch all the way around 1/2 an inch from the edge until you get back to the opening. Use a safety pin to glide your elastic through. Sew the elastic together with a zig zag stitch and then sew the opening closed. Looks really gentle and gentle! I like your style! می شود گفت که روش های درمان بواسیر در کمترین زمان کم نیستند مزایای درمان بواسیر با لیزر در مقایسه با سایر روش های درمان بواسیر زیاد است، این مزایا در آسانی این روش، انجام در وقت کم و استفاده نکردن از مواد بیهوشی سایر روشها، استفاده از لیزر برای برش خلاصه می شود.علت بواسیر چیست؟ بواسیر یا همان هموروئید در پایین ترین ناحیه راست روده و انسداد رگ ها ظاهر شده و باعث متورم شدن آن ناحیه می شود. راه های یافتن بهترین دکتر بواسیر, پزشک بواسیر, متخصص بواسیر یا هموروئید با رشد روزافزون فضای مجازی کاری سخت نیست. شما می توانید به بهترین مرکز درمان بواسیر مراجعه کنید.درمان شقاق با لیزر در حالت کلی عوارض جانبی ندارد ولی در مواردی نادر می تواند باعث توسعه فیستول، ​عفونت، بی‌ اختیاری کنترل مدفوع، خونریزی ​دو هفته ای باشد.